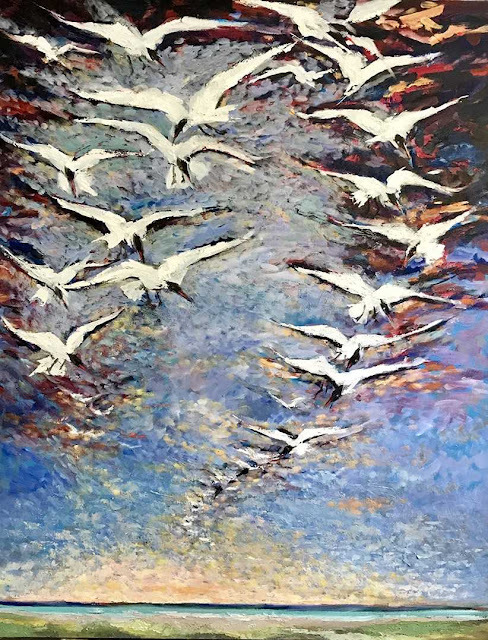 Brevard Art News: Work by Frits Van Eeden featured at Fifth Avenue Art Gallery during July. Work by Frits Van Eeden featured at Fifth Avenue Art Gallery during July. Work by Frits Van Eeden will be featured at Fifth Avenue Art Gallery during the month of July. Process is an exhibition of drawings, sculptures, and paintings. There will be an Opening Reception on First Friday, July 6th, from 5:30 - 8:30 pm. We are very sorry, but due to the artist's personal reasons the Second Saturday talk has been cancelled. Recently returned from the Netherlands after a successful exhibition at the Pulchri Studio Den Hag, Frits is offering a rare opportunity to see an all inclusive exhibit of drawings, sculpture, and paintings that demonstrate the creative “process”, from paper to paint. Van Eeden was born in Tilburg in the Netherlands and studied in the "De Vrije School" in the Hague. He then studied in the “Rietveld Acadamy” and was offered membership to the “Pulchri Studio” were he pursued sculpting and painting. He began visiting the United States in the 1970s. In 1979 he entered a juried exhibit at the Artist Forum of Brevard Art Center and Museum of Melbourne. His work won Best in Show. The award was a One Man Show at the museum. He then received a grant from the State of Florida and was made Artist-in Residence at the museum and has served on and off as a major instructor for over 30 years. Over the years until present day, he has inspired and instructed hundreds of students with his spontaneous style and genius for color and composition. Frits’ work shows in Europe, the Caribbean and the United States. The exhibit will run from July 3 - July 31. Fifth Avenue Art Gallery is located in the Arts Districts of Eau Gallie in Melbourne, FL. All events are free and open to the public. Labels: Work by Frits Van Eeden featured at Fifth Avenue Art Gallery during July.